A proposal: one morning of every weekend [...], we meet up for a morning game of chess at Annies [Devour Cafe]. We play only one game, and alternate who's white/black each weekend. Dane was in. I had a semi-neutral party (Davina) flip a coin and the coin said Dane was going to be White. We played our first game today. ... and then I forgot my Knight was guarding my Rook when I moved it on move 18 - I'd seen earlier the potential for a White Bishop sacrifice (which ended up happening on White's 19th move), essentially a trade of a Bishop for a Pawn and Rook. All good for White. I was almost ready to resign, but the shift in the game came when I advanced my b Pawn one more square - move 20 for Black. Dane didn't see that my Bishop was now attacking his Rook. He took my Pawn and then I took his Rook, essentially evening the game up. The game continued for another 13 moves before Dane offered a draw, which I accepted. 1. e4 e5 2. 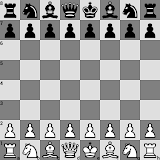 Nf3 Nf6 3. d4 exd4 4. e5 Bb4+ 5. c3 dxc3 6. bxc3 Ba5 7. exf6 Qxf6 8. Qe2+ Qe6 9. Qxe6+ dxe6 10. Bd3 O-O 11. O-O Rd8 12. Rd1 c5 13. c4 Nc6 14. a3 b6 15. Bb2 f6 16. Nc3 a6 17. Ne2 e5 18. Nc3 Ne7?? 19. Bxh7+! Kxh7 20. Rxd8 b5 21. cxb5?? Bxd8 22. bxa6 Bxa6 23. Ne4 Rb8 24. Nxc5 Rxb2 25. Nxa6 Bb6 26. Rf1 Ra2 27. Nb4 Rxa3 28. Nc2 Ra2 29. Ne3 g5 30. Rb1 Bxe3 31. fxe3 Kg6 32. g4 Re2 33. Re1 White offers draw, Black accepts.